I am a Freelance Route Setter and Climbing instructor based in the lovely city of Bristol. I spend a lot of my time climbing out on the rock around the southwest and beyond but also surfing and hiking in the hills. I enjoy a challenge and the physical and creative aspects that setting work offers. I have been setting since 2013 when I was working at Redpoint climbing centre in Bristol. here I learnt to set on the ropes under the guidance of Jack Griffiths and also in the boulder wall. 2014-16 I was working at Bloc Climbing centre in Bristol and have been setting boulders and circuits at the wall with head setter Cailean Harker and other guest setters. 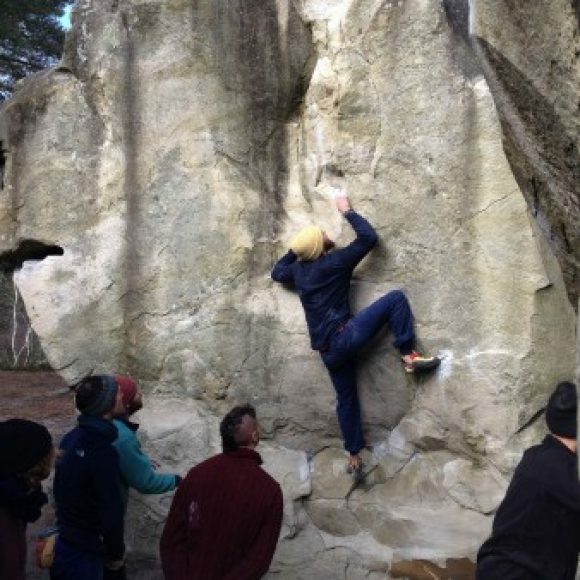 I have also been setting routes at Undercover rock in Bristol and continuing freelance sets at Redpoint. In 2016 I started freelance work around the country and have been doing boulder and rope sets in a variety of different walls including Big Rock, the XC, and Highsports centres. I completed the RSA level 1 in August 2015 and RSA level 2 in August 2016. I also hold a CWA qualification and coach youth and adult groups to all ability levels. I climb outdoors as much as possible especially around the south west to a sport climbing grade of 8a and boulder up to 7C/V9. I love visiting new climbing areas and have climbed around the UK on limestone, grit, hard and soft sandstone and a little granite. I have also been on multiple trips to Spain, France and Italy. This certainly adds to my experience as a setter as I am familiar with many styles, movements, shapes and sequences. In my setting I strive to create varied and engaging climbs that keep interest throughout the grades. However challenging the climb, it needs to be inspiring and make people come back for more.